Yesterday I saw an awesome recipe for Triple Chocolate Brownie Pie. There is no way that I can justify making that...at least right now. So I've been scouting for entree recipes that incorporate more fruits and veggies (and an occasional whole grain if I'm feeling particularly nutritious). I'm on the Betty Crocker email list and they sent a link to their Best of 2011 recipes. Not surprisingly they are mostly desserts. But I found this recipe in the mix. I love buffalo chicken in almost any form. Chicken wings have too much wing and not enough chicken for me, but boneless wings (an oxymoron if there ever was) or buffalo chicken sandwiches/wraps....mmmm. Buffalo chicken doesn't have to be a calorie killer, if you focus more on the hot sauce and less on frying and mad quantities of blue cheese or ranch. This is an crockpot recipe. If you do it overnight, you'd better like the smell of chicken chili in the morning. Spray your 5 to 6 quart crockpot with cooking spray. Combine all ingredients below and then cook on low for 8-10 hours. Light ranch dressing, blue cheese crumbles, and celery sticks for garnish. The blue cheese crumbles really tied the whole thing together. Enjoy! This sounds incredibly tasty! Love the idea and recipe!Have a great weekend! Ooh! I do like what you have pulled together here. 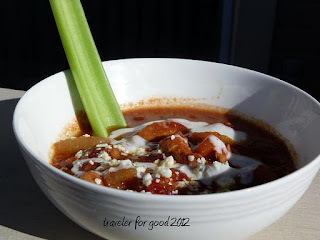 Definitely a delicious twist on the standard chili-yum! Well worth trying. Thanks for your comments. Anything that can justify a little blue cheese and hot sauce is good for me!